Input Signal Selection All Ovation High Fidelity preamplifiers use very high performance, fully sealed relays for signal selection and switching. These devices are used in industrial, military and telecom applications, where reliability (failure rates of not more than a few parts per billion) and longevity (20+ years service life) are of the utmost importance. The devices we use are made in Japan and have a guaranteed mechanical life of over 50 (fifty) million operations, while the full load electrical life is guaranteed at over half a million operations. Since the relay in this application is only used at a fraction of its electrical rating, the electrical life is also many millions of operations ensuring a long service life. Importantly, the internal relay mechanism is never exposed to the atmosphere and the silver – palladium and gold clad contacts therefore remain uncontaminated and completely wear free for the 20+ year expected life of the product. Level Adjustment Some of our preamplifiers use motorized (to support the remote control function) Alps ‘Blue Velvet’ potentiometers, acknowledged throughout the audio industry for their excellent inter-channel tracking performance and transparent sound. A standard value of 10k Ohms is used and this provides the best balance between load on the source components and low Johnson noise. The other technique we use is a 10k 64 step relay based R2R ladder arrangement driven by a rotary encoder plus microprocessor which like the motorized potentiometer mentioned above, allows remote control to be easily implemented. In both approaches, signal transparency (i.e. very low or non-existent distortion and noise) and long service life to specification are the primary design objectives. Component Selection In a preamplifier which is dealing with line level signals in the 1 V range and phono signals in the 500 microvolt to 3 millivolt range, component selection for minimum noise and distortion is critical. We therefore use high quality metal film resistors rated at 0.5 W for all critical resistors in the signal path from Vishay, Dale and Beyerschlag. Our film and NPO capacitors used for coupling and equalization functions are supplied by Panasonic, Vishay and Wima. Furthermore, we only source semiconductor components from reputable, world class suppliers like ADI, ON, Nexperia, NXP and TI amongst others. Power Supplies In a preamplifier, given the low level signals involved, it goes without saying that the associated power supplies have to be exceedingly quiet both in terms of radiated transformer noise, conducted ripple and Johnson noise. The Model 1501 uses a very high quality toroidal transformer, followed by a two stage regulator circuit – the first filtering out any reservoir capacitor ripple, and the second consisting of a low noise integrated regulator. This configuration delivers supply rail ripple of greater than -120dB reference the input across the audio band. To ensure there is no possibility of power rail ringing on fast transients and to minimize noise, each gain stage is fed through a R-C network. This isolates each stage from the next, heavily damps the supply rails and also reduces HF Johnson noise, an overall approach that we think goes quite some way to explaining the very smooth, relaxed sonic signature of our products. RIAA Phono Equalization Much has been written on this subject over the years and from a purely engineering and technical perspective, it can only be concluded that most approaches are highly compromised. All-passive schemes, much in vogue nowadays, are really only suited to vacuum tube based designs where the large voltage swings are available to support the necessary high frequency headroom required that this approach demands while the high current drive requirements for all-active EQ topologies preclude their use in vacuum tube designs. The only alternative if the designer wants to pursue this route is to increase the EQ network impedance, but that in turn requires a further trade off with respect to noise. 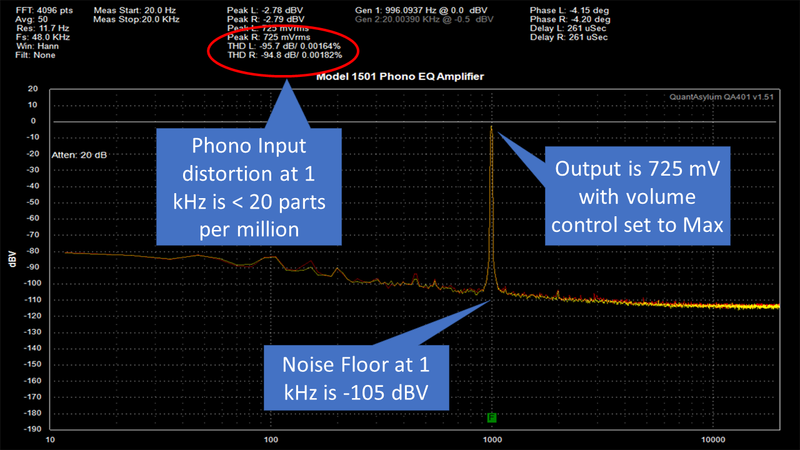 Pictured below, the distortion and noise performance of the Model 1501 MM phono stage as measured on a QuantAssylum 401 Audio Analyzer. The analyser noise floor is -135 dBV (50x average). 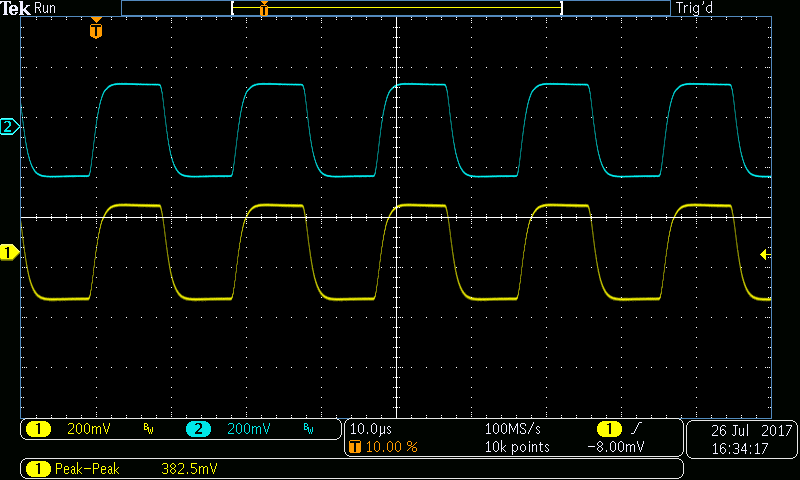 In short, all active EQ is not suited to vacuum tube designs in RIAA EQ applications. For solid state designs, all passive or active/passive equalization approaches similar to those used in vacuum tubes require that two serious tradeoffs be made: much higher noise and much reduced overload capability. Ovation High Fidelity phono equalizers use all-active equalization using the EQ network design methodology proposed by mathematician Stanley Lipshitz in his seminal 1979 Audio Engineering Society (AES) paper On RIAA Equalization Networks. Firstly, this provides our equalizers with industry leading overload capability of > 32dB ref 3mV across the audio band. Further, unlike all-passive and active-passive schemes, this overload capability applies across the entire audio band from 20 Hz through to 20 kHz and beyond. Secondly, because of the shape of the RIAA equalization curve, the all active approach has the added benefit of curtailing Johnson noise above 2.122 kHz with respect to the mid-band frequencies resulting in products that are altogether subjectively quieter than the competing active-passive or all passive schemes. Thus, with solid state designs, there are no trade-off’s to be made using the all active topology which delivers best in class overload capability and best in class noise performance. Our phono equalizers offer unmatched measured accuracy, deviating from the specified RIAA response curve by typically less than 0.1 dB (0.2 dB maximum) from 20 Hz to 20 kHz. The response beyond 20 kHz is also important, and should by design, drop off gradually from above 50kHz, ensuring accurate conformance at 20 kHz – the upper limit of human hearing. The scope shot above (both left and right channels displayed) shows the Model 1501 Phono Preamplifier response to a 2 kHz square wave that has been fed into the phono input through an Accurate Inverse RIAA (better than 0.025%). This network differentiates the square wave at its input, and the output going into the RIAA phono equalizer is therefore series of spikes aligned to the square wave edges. A phono amplifier with an ideal response should output a pristine square wave which is an exact replica of the input square wave, which in this case it does. This performance infers that the equalizer response is accurate out to at least 20 kHz. 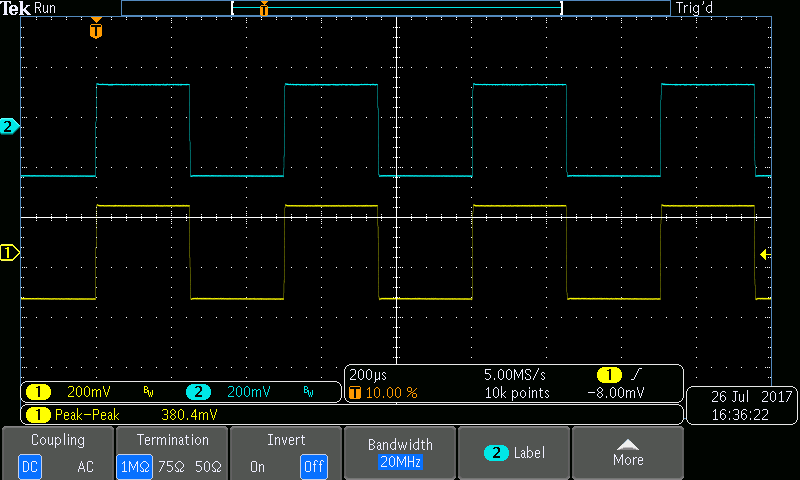 In the second scope shot below, we see the response to a 50 kHz input stimulus. The edges are rolled off, reflecting the gentle, controlled response drop off well above the upper hearing limit of 20 kHz – in short, text book performance on all counts. Layout and Construction Star grounding schemes are used to minimize common impedance coupling, which can degrade PSRR and distortion severely. Ferrous housings can introduce magnetic induction distortion (typically this is 3rd harmonic) which is avoided by using Aluminium for construction. Housings use non-ferrous fixings in most cases while on power amplifier products, air vents utilize stainless steel.